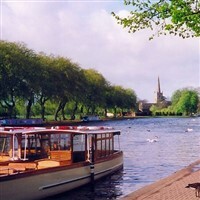 Stratford-upon-Avon, a medieval market town in Englands West Midlands, is the 16th-century birthplace of William Shakespeare. Possibly the most famous writer in the English language, Shakespeare is known for his sonnets and plays such as 'Romeo and Juliet' and 'Hamlet'. The Royal Shakespeare Company performs his plays in the Royal Shakespeare Theatre and adjacent Swan Theatre on the banks of the River Avon.